The U.S. Postal Service has given the go-ahead to design a collectible stamp that will feature Apple co-founder Steve Jobs, with the commemorative piece slated for release in 2015. A "secret" list of upcoming collectible stamps from the Citizens' Stamp Advisory Committee (CSAC) reveals Jobs to be one of the featured subjects of an upcoming collectible set to debut in 2015, reports The Washington Post. 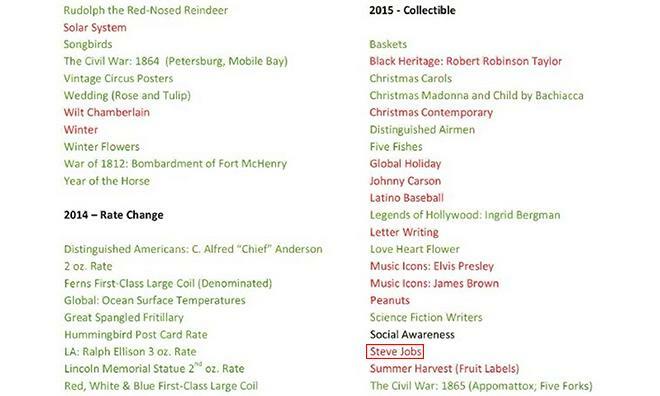 Jobs is joined by other other pop culture icons like Johnny Carson and the comic strip Peanuts. According to its charter, the CSAC was established in 1957 to portray the American experience to a world audience through postage stamps and postal stationery. Every year, thousands of letters proposing new stamp ideas are sent to USPS, the CSAC's job is to evaluate the merits of each on behalf of the Postmaster General. While not assigned to any specific series, such as "Music Icons" or "Legends of Hollywood," the Jobs stamp is said to be in the design development stage. Following completion of the design, the stamp must then be approved before it hits USPS outlets nationwide. The list is not final, however, as USPS executive director for stamp services and corporate licensing Susan McGowan notes, saying the options "are subject to change" at any time. With work already being done on the Jobs' stamp, however, the chances of it becoming an actual product are somewhat higher compared to those not yet in the design phase. Along with the usual USPS hallmark series portraying historical figures and sites, the Postal Service will continuing a slightly controversial initiative of featuring more modern subjects in a bid to garner interest from younger philatelists.